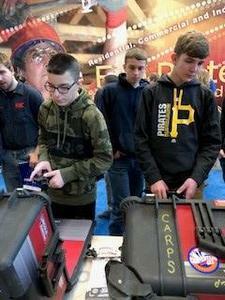 On March 29, students from Riverside attended Build On, a career fair presented by The Builders Guild Of Western Pennsylvania, Peoples, and CNX at the David L. Lawrence Convention Center. Students participated in interactive activities with regional building trade unions, industry partners, and tool and product suppliers. Students also had the opportunity to speak first hand with apprentices, training directors, recruiters, and others who provided insight into many of the well-paying, sustainable careers.